Maier, Larry B. and Stahl, Joseph W. Identification Discs of Union Soldiers in the Civil War: A Complete Classification Guide and Illustrated History. McFarland (August 15, 2008). 222 pages, many illustrations, index. ISBN: 978-0786433100 $55.00 (Hardcover). Did Civil War soldiers have dog tags? Surprisingly, yes they did, and they are referred to today as “identification discs”. In Identification Discs of Union Soldiers in the Civil War: A Complete Classification Guide and Illustrated History, authors Larry Maier and Joseph Stahl set out to define what an identification disc is, to catalog the various types of identification discs used during the war, to provide some brief biographies of soldiers whose identification discs still exist today, and to discuss how to tell the authenticity of such discs when buying and selling them either in person or online. In this profusely illustrated book they have fully succeeded in their efforts. The authors both have owned extensive collections of Civil War identification discs in their lives, making each well-suited to pen a book on this topic. Joseph Stahl recently appeared on the 10/24/2008 episode of Civil War Talk Radio. He also had a popular column in Gettysburg Magazine, a fact noted in the Foreword to the book by noted Civil War historian Ed Bearss. Identification discs appeared not long after the Battle of First Bull Run in response to the unprecedented casualty figures. Men wanted their families to know what had happened to them should they fall in battle with the field held by the enemy. Over the course of the war, many varieties of these identification discs appeared. In chapter 2, the authors do an excellent job of cataloguing all of the currently known patterns. Both the obverse (front) and reverse (rear) of each disc are shown in large images, allowing potential collectors a good idea of what they are getting into. A number and letter classification system is used, so get used to seeing terms like “McClellan (1A)” to describe each of the specific patterns. The illustrations are accompanied by other facts about the discs, including their rarity. McFarland was kind enough to give their permission to allow this review to feature a sample page from chapter 2. 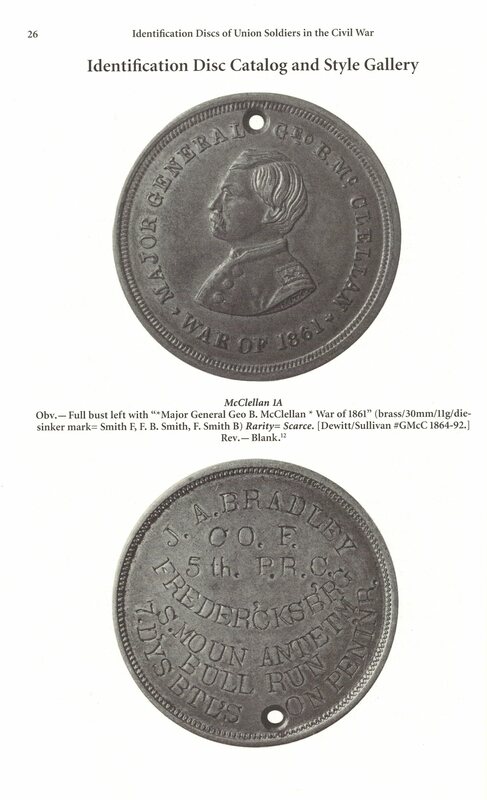 The following image (click on the image for a larger, more detailed view) shows the “McClellan 1A” type of Civil War identification disc. From Identification Discs of Union Soldiers in the Civil War: A Complete Classification Guide and Illustrated History © 2008 Larry B. Maier and Joseph W. Stahl by permission of McFarland & Company, Inc., Box 611, Jefferson NC 28640. www.mcfarlandpub.com. I found chapter three to be particularly interesting as a non-collector. The authors show 100 identification discs belonging to real soldiers and use these as a window to the past by giving a brief biography of each man. 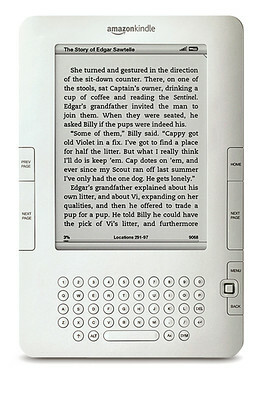 The authors encourage collectors to do the same thing with their own discs. Another interesting topic was how to determine the authenticity of identification discs you might see on the market. Despite some detailed examples of fraudulent discs and some good tips on ways to spot other fakes, the bottom line for the authors is that in most cases it is impossible to tell on your own. They have developed a checklist of items you should look for. The more items you can verify, the better you should feel about possible authenticity. The fifth chapter is essentially an appendix which lists regiments and includes company level information about which type of disc tended to be found with which company. Obviously due to the relative scarcity of discs this list is by no means complete and will never be complete. Still, it is a useful guide for the collector and yet another way to determine authenticity. The Epilogue looks at four soldiers, one from each regiment of Nagle’s IX Corps brigade at Antietam. The authors tell their stories, each ending with a different result. They point out that each man was probably wearing his identification disc at Antietam on September 17, 1862. Identification Discs of Union Soldiers in the Civil War: A Complete Classification Guide and Illustrated History will appeal mainly to relic collectors, and obviously identification disc collectors in particular. The authors do an excellent job collecting as much information as possible on these discs, and they supplement the text with a wonderful array of illustrations. While the book proved interesting to this non-collector, it will not prove to be terribly useful for Civil War buffs who are not into relic collecting. By far the most interesting parts of the book for non-collectors were the biographies in chapter three and the stories from the epilogue. 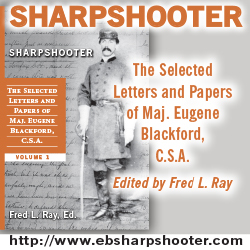 Despite its limited scope, the book fills its niche well and is highly recommended to those interested in collecting items from the Civil War era. I would like to thank Beth Cox and Lois Grubb at McFarland. You may order the book directly on McFarland’s web site or by calling 1-800-253-2187. Never heard of this. I thought that Union soldiers pinned tags with their names to their clothing before Cold Harbor precisely because there were no dog tags. Had there been so many casualties that they ran out? I hadn’t either. I’m not sure exactly how widespread these id discs were, but they were private efforts rather than government sponsored. The authors said they came into prominence as a result of the casualties at First Bull Run. I never knew there were id discs. Thanks I learned something new. You’re welcome! Honestly I didn’t either until I listened to the Civil War Talk Radio episode I mentioned in the review. In answer to the first comment, the ID discs were bought by the individual soldiers. So no they had not “run out” at Cold Harbor, it was a function of if the soldier wanted to spend money on a disc. A number of soldiers bought two and sent one home as a keepsake as we documented in the book. Thank you for stopping by and responding to the original question. Feel free to add anything else you want about the book as well! “Identification Discs” is an important addition to our knowledge of the Civil War and a good resource for the avid Civil War researcher. I found an ID disk dated 1862 with a mans name carved on it. It also has 13th calvary division. But it looks more like a flattened round poker chip. Would it be hand made or sultler issued?